“High Performing Sales Teams leverage 3 aspects of digital marketing extensively: sales analytics, mobile sales apps, and collaborative selling through a company-wide sales culture. 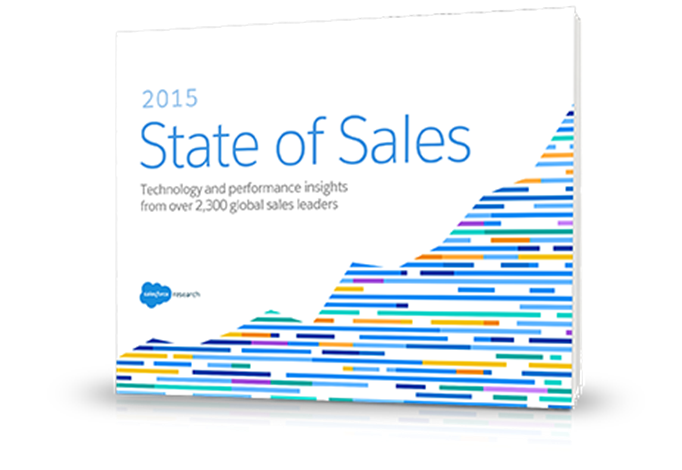 Predictive Analytics and Mobile Sales Apps are among the top new trends driving the future of sales.” These are the key findings of the new Salesforce 2015 State of Sales report released today. Download the report free below. To develop its its first-ever State of Sales report. Salesforce surveyed more than 2,300 sales leaders worldwide, the report examines the priorities, behaviors and technology use of today’s sales teams. The report found that higher performing sales teams are far more likely to maximize technology, particularly analytics and mobile, and leverage the entire organization in the sales cycle. Sales has changed dramatically over the last few years. The rise of mobile and social technologies have made customers more empowered and knowledgeable than ever before. According to the corporate advisory firm CEB, customers are already 57 percent through the buying cycle before even engaging with a salesperson. When customers do engage seriously with a brand, the selling cycle is competitive and compressed, and sales people need to move quickly to close the sale. Sales analytics use soars. The best sales teams are using data to make more informed, behavior-based decisions to fuel sales. Analytics help teams explore data such as revenue by quarter, year-over-year sales rep productivity and opportunity conversion rates to surface undiscovered trends and pinpoint areas to focus on to maximize future growth. 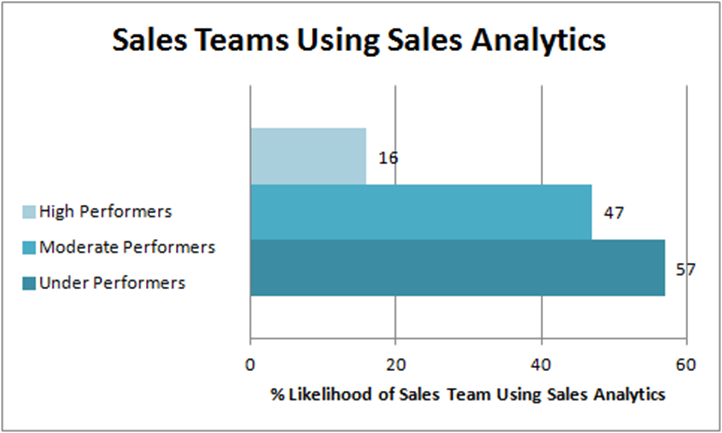 · High-performing sales teams are 3.5x more likely to use sales analytics than under-performing teams. · Predictive analytics, which looks at historical and current data to make forward-looking predictions, represents the next phase of analytics innovation. Among the companies surveyed, 19 percent are currently using predictive analytics, but adoption is expected to grow by 135 percent over the next 12-18 months. Mobile is becoming a key accelerator for sales. Inspired by consumer adoption, mobile devices and apps are now becoming mainstream for business users. Today’s highest performing sales reps use mobile apps for everything from lead management to sales forecasting. · Top sales organizations are nearly 5x more likely to rate their mobile sales capabilities as outstanding or very good. · Sixty percent of high-performing sales teams currently use or are planning to use a mobile sales app, while only nine percent of under-performing sales teams report using mobile apps in their sales processes. Among all sales leaders surveyed, mobile sales app use will more than double in the next two years, growing by 125 percent. · Customers and prospects increasingly expect to be able to buy products directly via mobile apps. More than half of high-performing companies currently deliver or plan to deliver sales directly to customers and prospects via a mobile app in the next two years. · According to an April 2015 Salesforce research report “Putting Wearables to Work,” 83 percent of all sales teams are currently using or planning to use wearables in some form in the next two years. Sales success now begins with a collaborative culture. Creating a culture where sales is the collective responsibility of the entire organization is critical to success. In many cases, that means breaking down silos and unifying sales and marketing processes to get a complete view of the customer. Companies with high-performing sales teams are nearly 3x as likely as under-performers to view sales as the responsibility of the whole company. High-performing teams also know that happy employees lead to happy customers, and 93 percent of top teams rate employee satisfaction as very important compared to 46 percent of under-performers. Sixty-one percent of high-performing sales teams have a single view of the customer, compared to just 14 percent of under-performing teams. High-performers supercharge their sales with technology. Technology is increasingly a divide between high and low performing sales teams. Winning teams are forward-thinking and quick to embrace new technologies to uncover insights, drive efficiencies and meet the demands of today’s customers. High-performing sales teams are more than twice as likely to be heavy tech adopters than moderate and under-performing teams. Technology accelerates sales processes 3x more often for high-performers than for under-performers. 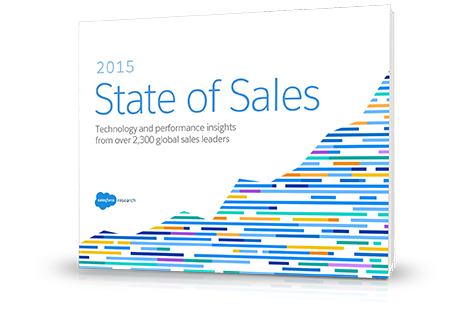 To download a full copy of the free report, 2015 State of Sales, click here. Survey participants rated themselves as to whether their sales organization was high-performing, moderate-performing or under-performing. 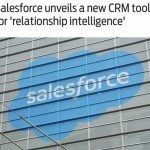 The Salesforce 2015 State of Sales report was conducted by Salesforce Research, which provides data-driven insights to help businesses transform how they connect with customers.